I posted this to the Parkinson’s disease online forum “Patients Like Me” today. I have been on this forum for the last four years and wanted to spread the word and joy I have after one year in the RSB program. I was diagnosed with Parkinson’s disease at 59 years of age. 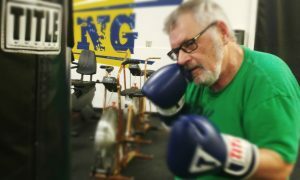 When you complete a year of attendance at Rock Steady Boxing, the staff does a repeat of a Parkinson’s symptom assessment that they have all participants complete prior to starting the program. I had mine yesterday and was amazed at the results. In every category I exceeded the initial assessment (on the good side). My improvement in balance, flexibility, small motor movements and stability was evident. This program really does work. I still hate exercise, but I hate where I was a year ago more. I still need to force myself to go to the gym, but know that without this program I would still be using a cane, I would find myself sinking deeper into my recliner and struggle more to just keep moving. I still need to take my Parkinson’s drugs, but I see my future in a much brighter light than before.